I love zucchini. Is there anything you can’t do with it? Throw it in cookies? Sure! Bread? No problem! Ravioli? Sign me up! Now how about pizza? 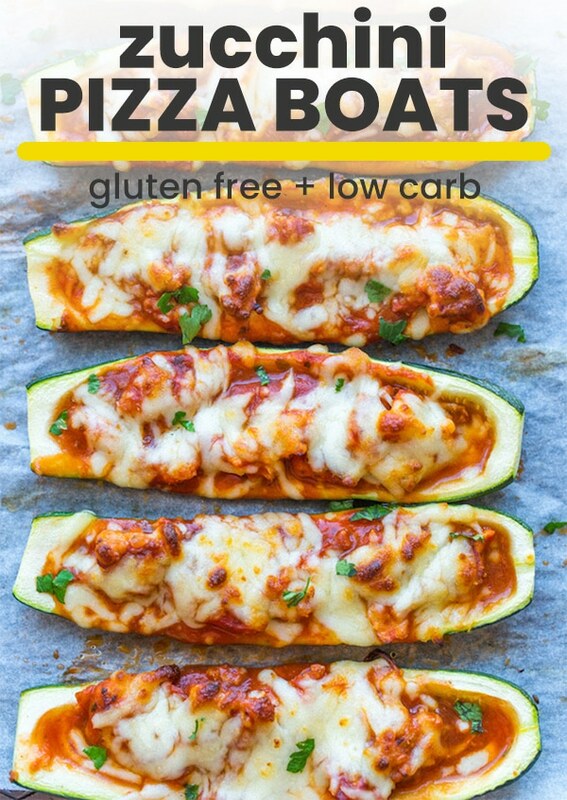 Low carb, meaty, cheese pizza stuffed zucchini boats? Let’s do it! Altogether this recipe is pretty simple and straight forward. You only need about 8 ingredients and these can be made in about 30 minutes making it a great option for a busy weeknight. Start out by prepping your zucchini. The zucchini prep is pretty straight forward – you just slice the zucchini in half lengthwise and hollow out the insides with a spoon or melon baller. Originally my recipe recommended adding the scooped out zucchini back to the filling to reduce waste. Ultimately I think it’s best to do without the watery insides as they tend to make the filling too watery. You can discard the leftover zucchini at this point or save and freeze for later use (more on that below). 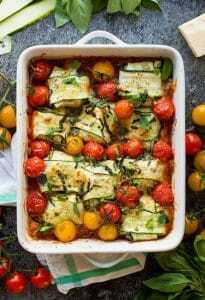 Once the zucchini has been hollowed out, lay out on a large baking sheet or casserole dish and set aside while you prep the filling. Cook your sausage through in a large skillet with a little bit of garlic. Add in the marinara (use a sugar free sauce if you’re watching your carbs), oregano, salt and pepper towards the end. Once cooked you can begin filling your zucchini boats. 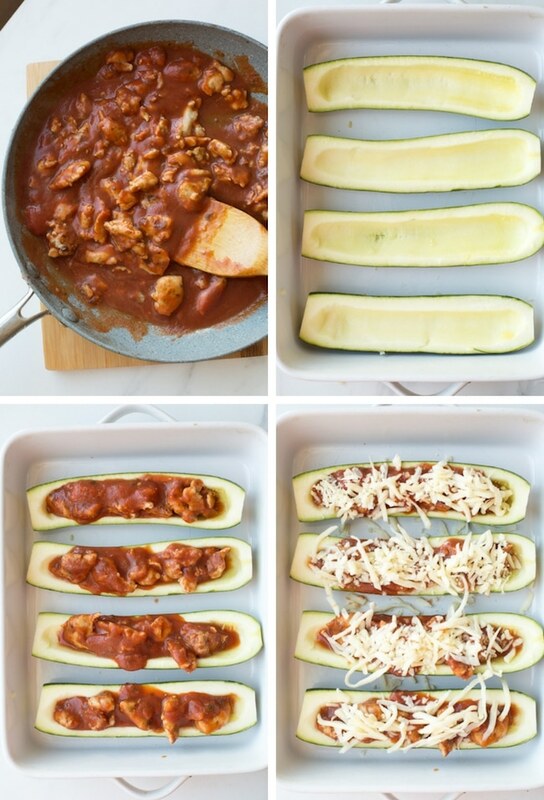 Carefully spoon the sausage mixture into the open zucchini halves, top with shredded mozzarella and that’s it. Place in your preheated oven and back for about 15 minutes until the cheese is bubbly and the zucchini tender. Do I have to use Sausage? No! You can use any type of sausage you like (chicken, turkey, etc), pepperoni, ground beef or skip the meat all together and just add veggies. Black olives, bell peppers, mushrooms – whatever you like. If you’re following a low carb diet then this recipe is for you! Two zucchini halves add up to about 11 grams carbs so depending on just how many carbs you can fit in your diet a day then you’re good to go. Just keep in mind that the type of sausage and marinara you use will change the nutrition info slightly. If it’s important to have accurate numbers then I recommend using a tool like MyFitnessPal to calculate your exact nutrition. 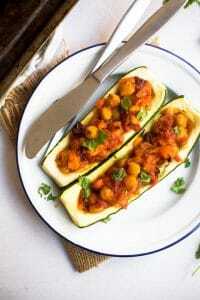 Can zucchini boats be frozen? You can try but I usually don’t recommend freezing zucchini unless it’s shredded (more on that below). Zucchini is a vegetable that is made up of mostly water. When frozen, their cell structures break causing them leak which will only result in a soggy puddle of water when defrosted. HOWEVER, if you really want to try it you will have more luck freezing these after they have already been cooked since some of the water will evaporate during the cooking. Once cooked, let cool completely, wrap up very well and then freeze for up to 1 month. When ready to enjoy, let defrost overnight and then reheat in the oven for about 15 minutes at the same temperature as the original cook. The zucchini will be much softer this way, but the flavour still very much enjoyable. Store leftovers in an airtight container in the fridge for 3-4 days. What do I do with the scooped out insides? Chop it up, squeeze out the excess water, bag it up and then freeze for later. 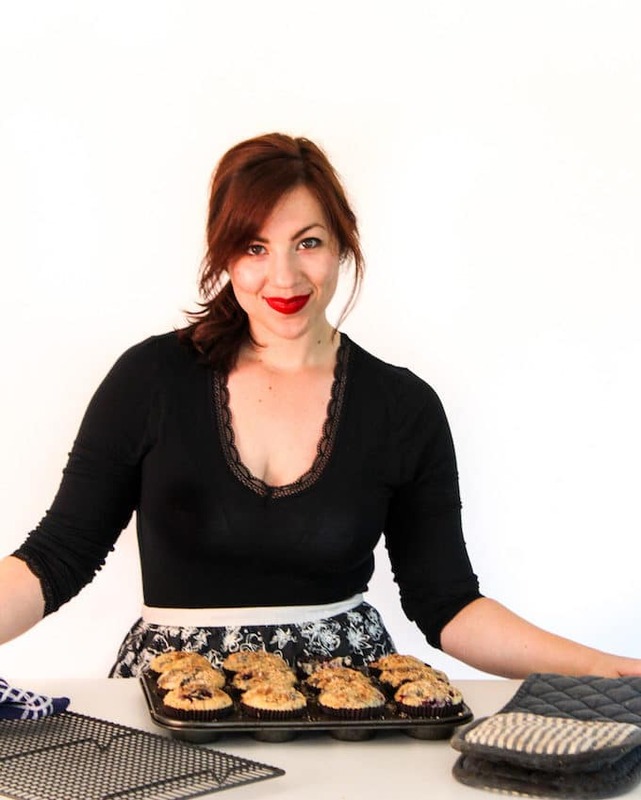 You can add the insides to things like zucchini bread, cookies, and other baked goods. When you’re ready to use it in baked goods, squeeze out the water and that’s it. Keep in mind that the amount of shredded/chopped zucchini that you freeze for later will reduce to about half as much after it’s frozen. As mentioned above – the zucchini will lose much of its water content. 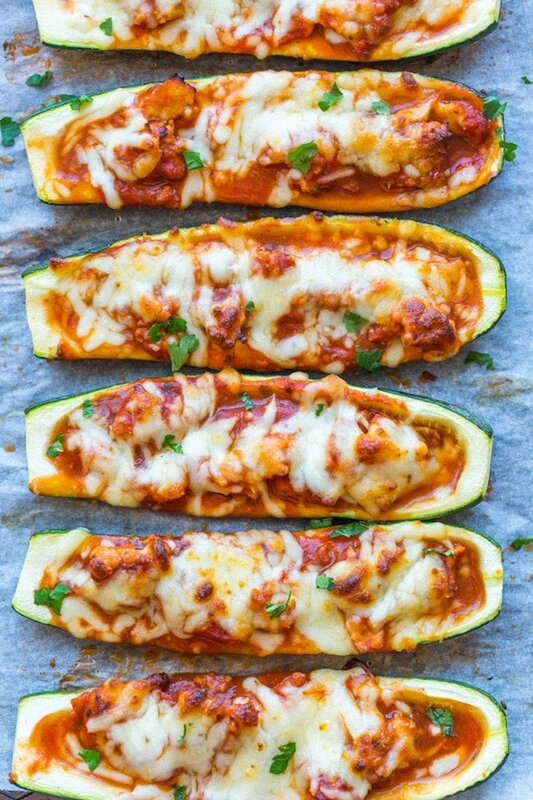 Don’t forget to #asaucykitchen on instagram if you try this Sausage Pizza Stuffed Zucchini Boats! We love seeing what you make! You can also post your pictures to my facebook page! Preheat oven to 400°F/205°C. Line or grease a large baking sheet or 9x13inch baking dish; set aside. Cut each zucchini in half horizontally, then carefully scoop out the centre of the zucchini, leaving about 1/2-inch of zucchini on the skin. The insides can be discarded as they are too watery to use here. Heat olive oil in a saucepan over medium high heat and cook the sausage until browned, about 3-5 minutes, making sure to crumble the sausage as it cooks. Add the garlic and cook one minute. Add the marinara to the sausage and stir well to combine. Add the oregano, salt and pepper. Carefully spoon the sausage mixture into each carved zucchini opening. Top with shredded mozzarella. 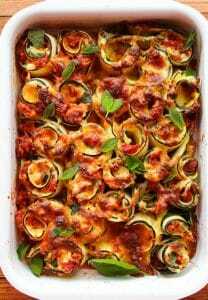 Place into oven and bake until the zucchini is tender and the cheese has melted, about 12-15 minutes until cheese is bubbly. Smaller zuchini's will need closer to 12 mintutes and larger zucchini closer to 15. Hi Fiona! I’ve actually had these for leftovers before and I thought it was still great, though I’d probably think that about anything containing sausage and cheese. Zucchini does lose a lot of it’s structure after cooking so some people may not like the texture. If you’re a fan of zucchini I think it be alright. Hope that helps! Hi Choclette! I’m so jealous that you’ve got your own courgette plants – the way we’ve been going through them it would definitely come in handy. Thanks for stopping by! These look amazing! 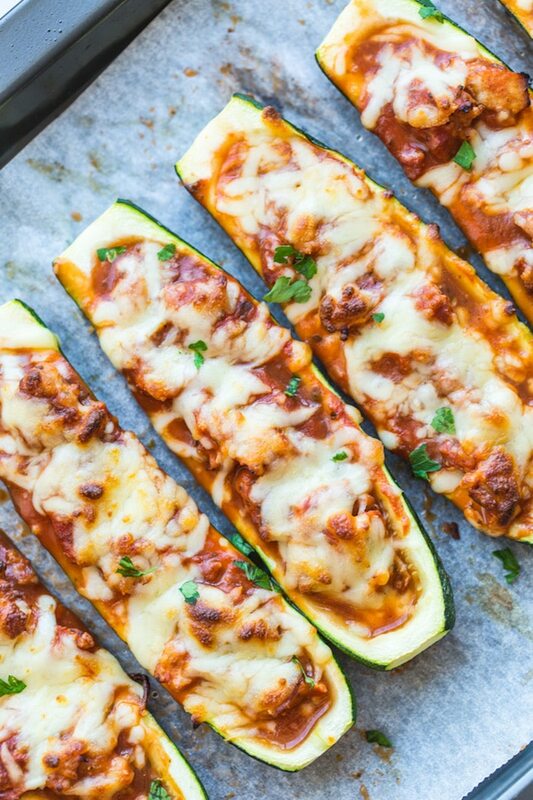 We’ve tried zucchini boats once, and I can only imagine how delicious they would be with pizza toppings! 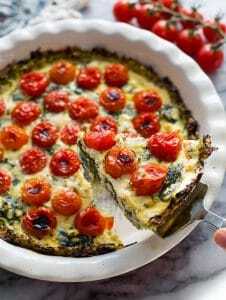 What a great low carb alternative~ Pinning! Thanks, Gabriel! I think pizza is just one of those things that always taste good – can’t go wrong with sauce and cheese, am I right? Your wife will love these! Dear Sarah – these look so delicious! Love that the zucchini is still bright green. such a pretty and satifsying dish, I would love this for dinner! Thank you, Allie! I do love the color that zucchini adds to my food – I feel healthier just looking at it!